Golf is a game of inches and the short putt puts more fear into a golfer than public speaking. History has shown that even the great players fail when faced with the moment of truth. Unbridled joy and bitter disgust are two sides of the same coin in golf. Nowhere is this duplicity felt more acutely than on the putting green. The pinnacle of annoyance and all that is rotten in the sport finds true expression in the missed short putt. Whereas Henry Cotton remarked that missing such a putt is not a good reason for missing your next drive, the unnecessary shot gnaws away inside you. How many golfers haven’t gone to the tee-box still seething about what happened moments earlier and hit their ball out of bounds or carve it into the rough? Contantino Rocca showed the stoic outlook you should adopt on such occasions when he said "I miss the putt it’s normal. I don’t kill anybody so I forget about it." It seems illogical that a well-struck drive of 250 yards can have the same shot value as the tap-in putt. Ben Hogan was not the first golfer to question the logic. To him ball striking was the true game. If ever golf goes decimal there will be a case for scores to reflect the distance the ball travelled. A tap-in putt could represent 0.3 of a shot. The idea of using distance as an indicator of the hole’s effective playing length and difficulty is already part of the game. Golf architects and course raters use distance guidelines to determine if a hole should be a par three, par four or par five. There are even golf courses with par sixes. 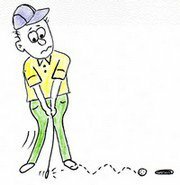 The reality is that all golfers, no matter what their handicap, will on occasion miss a short putt. Since the time the game was first played to a hole in the ground, the problem has remained the same. In 1876 during the first round of the British Open David Strath, the eventual runner-up, missed what was described as an improbable two-inch putt at the 15th. The missed short putt of the modern era is equally compelling. It reflects a golden opportunity lost in a moment of high tension. While it is more memorable when it takes place on the final hole of an event, earlier failure can still have a significant influence on the eventual outcome. Doug Sanders will go down in the history books not as the winner of 20 PGA events, nor the best dressed golfer, but as the person who unwillingly gifted the 1970 British Open to Jack Nicklaus. Faced with a 30-inch putt at the last hole of St Andrews he took ages over the ball before backing away to remove a tiny impediment. It was as if he was putting off the evil moment as long as possible. Unfortunately for Sanders his stabbed putt finished wide of the hole. Henry Longhurst, the Sunday Times golf correspondent for 45 years and TV commentator, summed up the mood of the gallery and golfers around the world when he whispered those immortal words "There, but for the grace of God ..."
At the 1983 British Open at Royal Birkdale Hale Irwin tied with Andy Bean. The winner for his fifth Open title was Tom Watson one shot ahead. At the 14th hole during the third round Irwin whiffed a short putt in an attempt to backhand it. When I saw the incident I thought that he was trying to avoid standing on another player’s line. The existing rules did not allow you to stand astride the line of your putt. In 2008 an exception was introduced allowing such a stance if you are trying not to stand on another player’s line of putt or prospective line of putt. However, in a later interview Irwin made no excuses and put down his mistake to carelessness. He made up for it 17 years later when he sank a monster putt across the green at the 72nd hole at Medinah to tie Mike Donald. Few present will forget his celebratory lap of honour around the green exchanging high-fives with the gallery. On the next day the two players again finished level after a further 18 holes. Irwin finally triumphed with a birdie on the first extra hole of sudden death to become the oldest winner of the title at 45 years. Scott Hoch had a different explanation for his misfortune at the 1989 Masters at Augusta National. He said that he forgot to line up the putter and kind of pulled it. It was just a poor effort, not a case of nerves. In fading light he had missed a two and a half foot putt at the first play-off hole for victory. On the next hole Nick Faldo sunk a long birdie putt to win his first Master’s green jacket. Eleven years earlier at the 1978 Masters Hubert Green missed a three-foot putt on the final hole to be in a play-off. Gary Player, trailing Green by seven shots at the start of the round, came from behind to win with a record-equaling score of 64. Ever since the Europeans were included in the Ryder Cup in 1979 there has been renewed interest in the fortunes of both teams. Previously the United States had dominated proceedings and the outcome was too one-sided. 1991 saw the European team compete against the Americans at Kiawah Island in South Carolina losing in the end by a point. It all came down to the final match between Bernhard Langer and Hale Irwin. The drama was played out on the final green with Langer needing to make a six-foot putt to win and for Europe to retain the trophy. In a cruel twist of fate there were two spike marks on Langer’s line. With the putt left edge Langer and his caddie Peter Coleman decided to take the break out by putting straight and firm. History will record that the putt missed and that the Americans won back the Ryder Cup by a point. Fast forward 10 years and Retief Goosen had a two-foot putt to win the 2001 US Open at Oakland Hills. The short putt never even hit the hole. Goosen then holed a longer third putt to be in a play-off with Mark Brooks. Earlier Stewart Cink anticipating that Goosen would be the outright winner, lost concentration and messed up his 18-inch putt that would have put him in the play-off. After an evening session with Dr Jos Vanstiphout, a sports psychologist, Goosen went out the next day and captured the title. And so the saga of missed short putts continues. As long as people compete against each other on the golf course there will be moments when some childhood dreams are snatched away when victory was so near. It is said that Green went back later to the 18th green and after five attempts still could not make the short putt he missed earlier. It would appear that some putts are destined to remain above ground.